Adding beads to my Fuschia Nightsong Shawl made it a knockout knitted object and gave me a new appreciation for the work involved in beading. 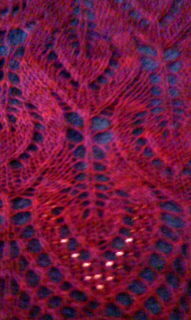 While adding the red glass beads to my shawl, I realized that I had been more ambitious about beading than a realized. What looked like a small decorative addition was a significant amount of work (related four letter words, at least at first). After my third row of adding four clear red beads per pattern repeat, I realized that since the holes of about a third of the beads made them unusable I was going to run out of beads. Unfortunately, I had purchased the last tube of clear red glass beads from Bruce Frank Beads. I used size 6 beads with a size 10 crochet hook. With my shawl tucked in my bag, I returned to Bruce Frank Beads and found a pink bead that sparkled and coordinated with the clear red beads and my fushia-purple yarn. I bought a tube of these beads. Since I had already put a lot of work into the beading that I had done and I was afraid that undoing the knitting and beading would weaken or make the yarn unknittable, I decided to modify my design for beading so that it looked like I intended to add a second color bead all along. My advice for those who considering adding beads to your work–over estimate the number of beads that you will need. Like extra stash you can always find a place to add them. Also, include a percentage for beads that are poorly made.